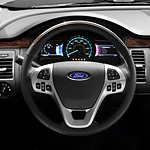 Ford Co-Pilot360 uses a host of technologies to help driver's safely navigate congested roads and overcome distractions. We here at Keith White Ford-Lincoln love the entire suite of technologies, but the following two are worth mentioning here. Blindspot Information System (BLIS) works by radar, detecting vehicles that veer into your blind spot while you're on the road. The detection registers as an alert light in your side view mirror, helping you merge and change lanes safely. BLIS also detects vehicles and pedestrians that cross behind you as you're backing out of a parking spot. Ford Fusion tech features are a sweet selling point for us here at Keith White Ford-Lincoln. More than just selling vehicles, we aim to match you with a vehicle that brings long term value and convenience to you while maintaining optimal efficiency. Luckily, the Ford Fusion fits this description to the tee. Ford Fusion gives you three energy modes to choose from. You can use EV Now, which is primarily plug-in energy, or EV Later, which saves plug-in energy for later. Auto EV uses plug-in energy for the most part, tapping into the gas engine as needed. The new Ford Escape is the perfect compact SUV for driving around town. Keith White Ford Lincoln wants to show people all of the amenities that make this vehicle comfortable and pleasant to drive. For the convenience of the driver, it is equipped with SiriusXM Traffic and Travel Link. You'll be able to get voice-guided navigation and use a variety of maps to get you to your destination in a hassle-free manner. The Ford Escape also comes with SiriusXM, providing you with access to more than 150 channels of music, sports, entertainment, and news. With the Super Duty, you can choose Adaptive Cruise Control with Collision Warning. Adaptive Cruise Control monitors the traffic speed and can slow the speed of the Super Duty when the traffic ahead slows. When the traffic speed has picked up, Adaptive Cruise Control will resume the preset speed. When it comes to choosing your next new car, finding the right set of features and technology play an important part in the selection process. Each member of our team is here to help you find that next new car and is excited to introduce this popular midsize SUV. Are you a music lover who enjoys the finer details of music? If so, check out the new Ford Ranger. This new mid-sized pickup truck is available with a premium audio system that's designed to make your media collection sound as clear as possible on the road. The Bang & Olufsen sound system is available on numerous models at Keith White Ford. It features 10 speakers and an amplifier that outputs as much as 675 watts of power. This isn't just a standard sound system; every detail is fine-tuned for optimal quality. The Mustang has long been a popular muscle car. Ongoing improvements in design and style make the Mustang better each year. The vehicle is made for power and performance. The newest models have enhanced handling ability. Indulge in a test drive by making a trip to our Ford sales facility. The design of the independent rear suspension includes rear knuckles and H-arms to reduce body roll and terrain imperfections. The result means the Mustang becomes more responsive and easier to handle on the open road. The Ford Explorer has many features that make your driving experience more pleasant. Whether you are looking for a vehicle that has cruise control or you would like to experience a more advanced feature such as an alert that warns you when you are drifting lanes, the Ford Explorer will keep you safe and entertained. The Ford Safe and Smart Package is one unique feature that the Ford Explorer offers. This package has rain-sensing wipers, auto high-beam headlamps, a lane-keeping system that detects and alerts you to drift your vehicle, and adaptive cruise control. Powerful, smart and convenient, the 2019 Ford Flex is a full-size SUV that satisfies the demands of American families. You can test drive the SE, SEL and Limited editions of this spacious vehicle at Keith White Ford-Lincoln. The second row in the Flex is available with premium bucket seats that have a 40/40 flat-folding configuration for the ultimate versatility. Operating on the PowerFold technology, the third-rows seats could be easily set to a desirable position. With a push of an electronic button, you can adjust these advanced seats to the Normal, Stow, Tailgate or RH/LH modes. The Ford Escape has been on the top list for compact SUVs for some time. The 2019 models are no exception. 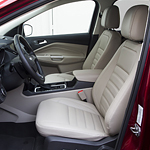 With a superior performance rating, the interior features on the Ford Escape set it apart from competition even further. The new models have a more spacious cabin, but the handsome styling makes it better than others in the same class. That must be why it’s ranked second in the compact SUV market by US News & World Report.